According to Government House, in a letter forwarded to congressional leaders, the governor outlined the costs associated with restoring the territory’s power system, rebuilding schools and hospitals, repairing government facilities and covering revenue losses as a result of Hurricanes Irma and Maria. The announcement comes on the heels of Mr Mapp’s previous estimate of $750 million, which was the figure he gave President Donald J. Trump during their face-to-face nearly two weeks ago on the USS Kearsarge. 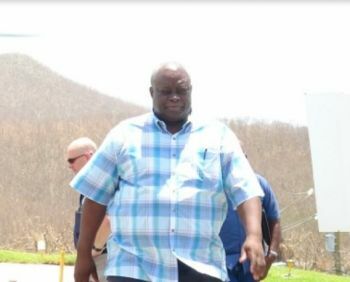 Mr Mapp did say that a proper assessment was being conducted by both the local government and its federal partners, that would determine the true cost of Hurricanes Irma and Maria. The numbers have arrived: In collaboration with the Federal Emergency Management Agency (FEMA) and other federal agencies, the Virgin Islands government completed a detailed sector-by-sector assessment of the damages across the territory in order to arrive at the $5.5 billion figure, Government House said. The most significant costs are for housing – estimated at $1.36 billion. Rebuilding destroyed schools is expected to cost $715 million and restoring the US Virgin Islands power system is estimated to cost $680 million, according to Government House. It was not clear whether the $680 million figure to rebuild the territory’s power system factored in placing the power grid underground. Government House said Mr Mapp addressed his appeal to Senators Mitch McConnell and Charles Schumer and to House members Paul Ryan, Nancy Pelosi and Virgin Islands Delegate Stacey E. Plaskett. The governor told Congress that more than 100,000 Virgin Islanders were affected by Hurricanes Irma and Maria – which came a mere 12 days apart and brought winds of up to 200+mph and more than 20 inches of rain, Government House said. “Power lines are strewn across our roads; utility poles snapped in half like matchsticks; boats lie sunken in the harbors; many thousands of our homes stand heavily damaged or destroyed and some of our major road systems are impassable,” the governor wrote. “Many structures on our beautiful islands are gone, reduced to rubble by the tremendous force of these back-to-back Category 5 storms. Both of our hospitals and the appurtenant health facilities, four schools, two fire stations, a police station, and much of our infrastructure have been destroyed. The terminals at the Cyril E. King and Henry Rohlsen airports are heavily damaged. He explained that in addition to the physical damage, the US Virgin Islands economy had “ground to a near standstill” and that the loss of revenue will subject the government to unsustainable cash shortfalls. Losses to the general fund are estimated at $450 million. “We are at the U.S. government’s mercy,” he said. Well he can ask but he aint getting a dime from Congress.